So this assignment for time traveling through your favorite websites is awesome! It’s funny how quickly we forget how certain websites looked before the last update, You constantly hear people complain about every new Facebook update but how quickly we forget how we hated the last update just as much. Way Back is a great tool to look back at how things were! But for the purpose of this assignment I chose to do a website that’s not Facebook. 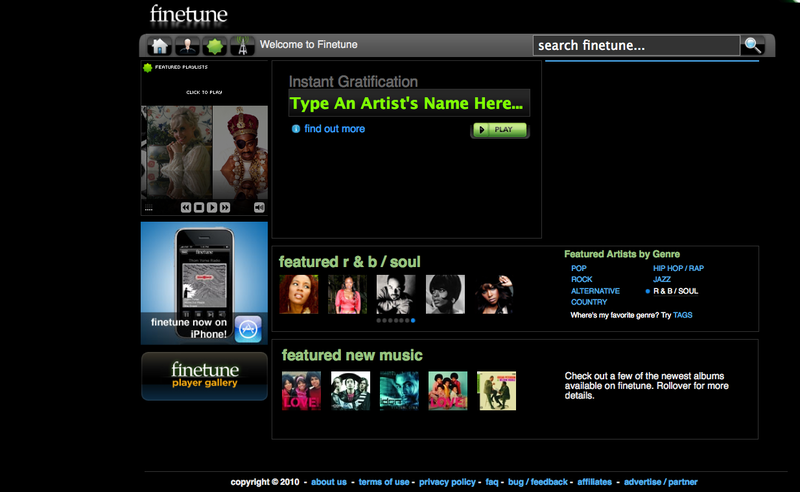 I picked one of my old favorite music websites called finetune. This website offered the ability to comb through their music catalog and create playlists. The only catches at first were you were only allowed 3 songs from the same artist per playlist and the playlist needed to be at least 45 songs long to be playable. This website opened me up to a whole world of music that would never known about through suggestions from similar artists and listening to other people’s playlists at my own leisure. It was a really good tool to get to know specific bands and songs because of listening to your playlists randomly being played multiple times. I spent many nights just going through music and learning about artists and new genres. Sadly the website is not what it once was. Because of the massive funding necessary to maintain a website like this and the money that would be due to record companies for using their songs, the website no longer offers the playlist building ability, This practically brought the community and usage of the site to a standstill, They are still in existence and have tried a few branch off ideas such as an online DJ similar to Last.FMs scrobbler that allows the website to access your iTunes and broadcast what you are currently listening to others but it never took off. Fine tune also offered a few different players that could let you use your Wii to stream music to your TV and another app to stream to your I-Phone. There are plenty of other websites that have developed like Fine tune such as Last.FM, Pandora, Grove shark and 8-track, but it is just inconvenient to have made all these playlist and not be able to add to them anymore. I think flaw finetune had to its structure was poor programming, it was prone to freeze up and load things in an odd way. Your player could often freeze or not load something causing you to have to restart the playlist. Also later on skipping songs became a limited ability, they did not want you to make playlists solely for the purpose of listening to one song and just skipping the rest as filler. This is true for most music player websites now though, with the exception of grooveshark. Music sharing is a touch subject, the lines of ownership, stealing and radio have become blurred because of the internet and how we use it. I don’t think these big companies and record labels that are against sites like fine tune and last.fm understand how greatly these internet radio sites affects the amount of people it brings to their artists. A lot of people do buy the albums and pay to go to concerts and buy the merchandise simply from finding the music on their own through interactive sites like this. It’s a shame that they are constantly being threatened by being shut down under different copyright acts. All images are from http://archive.org/web/web.php and Finetune.com. Are these images of FineTune taken at different times in the past? I’m curious about far back the images go and when they are from.